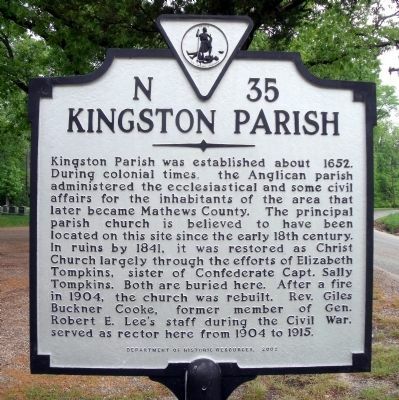 Kingston Parish was established about 1652. 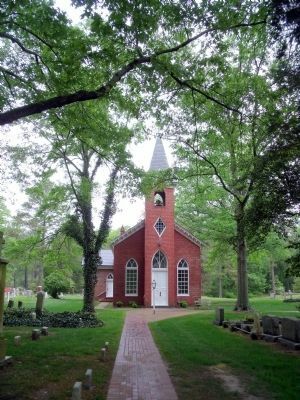 During colonial times, the Anglican parish administered the ecclesiastical and some civil affairs for the inhabitants of the area that later became Mathews County. The principal parish church is believed to have been located on this site since the early 18th century. In ruins by 1841, it was restored as Christ Church largely through the efforts of Elizabeth Tompkins, sister of Confederate Capt. Sally Tompkins. Both are buried here. After a fire in 1904, the church was rebuilt. Rev. Giles Buckner Cooke, former member of Gen. Robert E. Lee's staff during the Civil War, served as rector here from 1904 to 1915. Location. 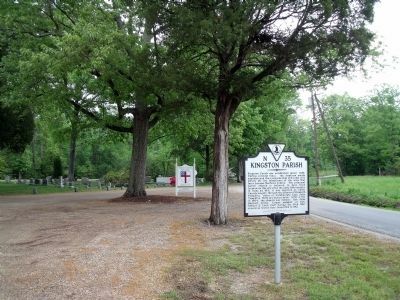 37° 24.596′ N, 76° 20.103′ W. Marker is near Mathews, Virginia, in Mathews County. Marker is on Williams Wharf Road (Virginia Route 614) 0.3 miles west of New Point Comfort Highway (Virginia Route 14), on the right when traveling west. Touch for map. Marker is in this post office area: Mathews VA 23109, United States of America. Touch for directions. of this marker, measured as the crow flies. Captain Sally L. Tompkins, C.S.A. Monument (within shouting distance of this marker); Fort Cricket Hill (approx. 1.8 miles away); Civil War In Mathews County (approx. 1.8 miles away); Mathews County Courthouse Square (approx. 1.8 miles away); Mathews County Confederate Monument (approx. 1.8 miles away); Captain Sally L. Tompkins, C.S.A. (approx. 1.8 miles away); Kingston Parish Glebe (approx. 2.1 miles away); Fitchett's Wharf (approx. 3.3 miles away). Touch for a list and map of all markers in Mathews. More. Search the internet for Kingston Parish. Credits. This page was last revised on June 16, 2016. This page originally submitted on April 26, 2010, by Bernard Fisher of Mechanicsville, Virginia. This page has been viewed 1,134 times since then and 14 times this year. Photos: 1, 2, 3. submitted on April 26, 2010, by Bernard Fisher of Mechanicsville, Virginia.